The hospital began as the Middlesex Infirmary, opening in the 1740s. It consisted of two small terraced houses in Windmill Street, off Tottenham Court Road. The original buildings were leased from Mr Goodge, a local landowner, and were later converted to accommodate 15 beds. The Middlesex was founded as a charity for the ‘sick and lame of Soho’ but included the slums of Seven Dials around St Giles-in-the-Fields in its care. For six centuries, London only had two hospitals: St Bartholomew’s and St Thomas’. In 1719, the Westminster was founded, followed in succession by Guy’s, St George’s, The London and in August 1745, The Middlesex, so called because London at that time was part of the county of Middlesex. When open maternity beds were added in 1747, the first ever in a general hospital, the total number of beds increased from 15 to 25. The demand for beds was considerable and the number increased again to 40. Some patients had to be accommodated in neighbouring houses. A new site was found in Marylebone Fields on the estate of Mr Charles Berners and a lease was signed for 999 years at £15 a year. On 15 May 1755, the Earl of Northumberland, President of the Hospital, laid the foundation stone on the current site. The hospital’s finances became difficult the Napoleonic Wars began, with many of the wards becoming empty due to lack of money. The hospital opened a ward for sick refugee clergy, who occupied one ward until 1814. By 1815, the hospital had 179 beds and by 1915, had been further enlarged by extending the wings to the street and adding a third floor. 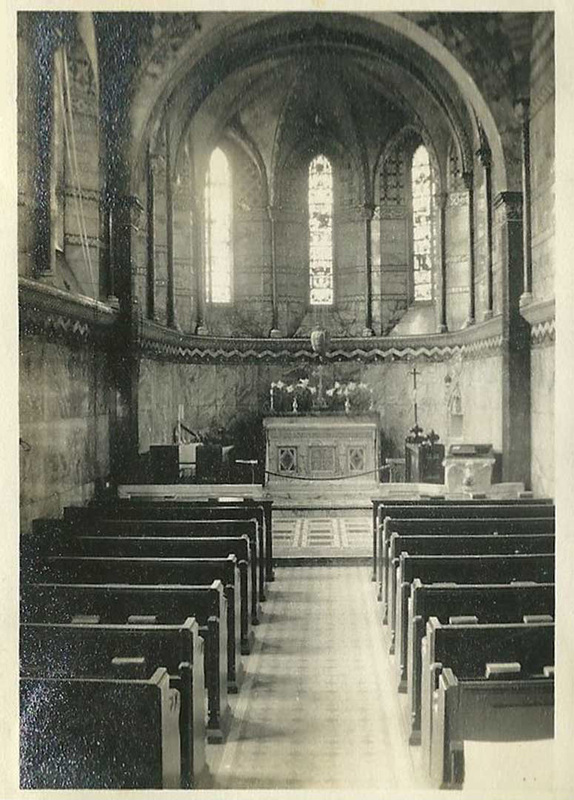 An old postcard of the chapel depicts how it looked before restoration. The chapel was built as a memorial to Major Alexander Henry Ross, MP, Chairman of the Board of hospital governors for 21 years. The chapel′s architect John Loughborough Pearson, one of the foremost gothic revivalists of his day, was commissioned in the late 1880s by governors of The Middlesex Hospital. In 1924, the original building was declared structurally unsafe and demolished. The cost of rebuilding was solely covered by donations and within three years, on 26 June 1928, the Duke of York, later King George VI, laid the foundation stone. The West Wing opened in 1929 and the Crosspiece and East Wing in 1935. Indeed the Duke of York returned to open the completed building on 29 May 1935. The hospital had been completely rebuilt, on the same site and in stages, without ever being closed. It has been paid for by more than £1 million of donations from the public. In 1992, the St. Peter’s Hospitals were closed down and moved into new accommodation in the Middlesex Hospital, which itself was merged into the University College London Hospitals NHS Trust in 1994. While part of the Bloomsbury Health Authority in the 1980s, the Middlesex Hospital was also associated with St Peter’s Hospital, Soho (urology); St Paul’s Hospital, Red Lion Square (skin and genito-urinary diseases); Soho Hospital for Women (gynaecological diseases); Horton and Banstead Hospitals (psychiatric disorders); Athlone House (geriatric care); and St. Luke’s (Woodside) Hospital (psychiatric disorders). The Middlesex Hospital Medical School traced its origins to 1746 (a year after the foundation of the Middlesex Hospital), when students were ‘walking the wards’. The motto of the medical school, ‘Miseris Succurrere Disco’, was provided by one of the deans, Dr William Cayley, from Virgil’s Queen Dido aiding a shipwreck: ‘Non ignara mali, miseris succurrere disco’ (‘Not unacquainted with misfortune myself, I learn to succour the distressed’). At the establishment of the then London University (now University College London), the governors of the Middlesex Hospital declined permission of the former’s medical students to use the wards of the Middlesex Hospital for clinical training. This refusal prompted the foundation of the North London Hospital, now University College Hospital. The medical schools of the Middlesex Hospital and University College Hospital merged in 1987 to form the University College and Middlesex School of Medicine (UCMSM). The current UCL Medical School, which resulted from the merger of UCMSM and the Royal Free Hospital School of Medicine in 1998, still honours the Middlesex Hospital in its coat of arms. The Courtauld Institute of Biochemistry of the Middlesex Hospital Medical School was opened by Samuel Augustine Courtauld in 1928, the foundation stone having been laid on 20 July 1927. Its main entrance was in Riding House Street. Courtauld also endowed a Chair of Biochemistry. Notable researchers at the institute include Frank Dickens FRS, Edward Charles Dodds FRS and Sir Brian Wellingham Windeyer FRCS (plaque holder). In January 1929, the Queen laid the foundation stone for a new nurses’ home in Foley Street, made possible by an anonymous gift of £300,000. The home, or rather Residential College for Nurses, was opened by Princess Alice, Countess of Athlone, in June 1931. It provided accommodation for 300 people: 230 Sisters and nurses, pupils of the Preliminary Training School, as well as those attending massage and midwifery courses, and domestic staff. The building also contained the Preliminary Training School and its classrooms, recreation and smoking rooms, badminton and tennis courts and, in the basement, a swimming pool (only to be used when at least three people were present, two of whom had to be good swimmers). The oak-panelled dining room was on the ground floor and the kitchen was capable of supplying meals for 300 people at one sitting. There was also a hairdressing salon in the basement. (It was later renamed John Astor House, after the anonymous donor was identified in 1948 when the hospital joined the NHS). A children’s ward opened in 1930 on the sixth floor of the new West Wing, which had been completed in 1929. The cots were bright blue. The walls of the ward were covered with tiles illustrating nursery rhymes, which had been donated by Bernhard Baron, who had also given £10,000 to the hospital. The ward had its own kitchen and a sun balcony. Newly admitted patients were accommodated in isolation rooms, which were separated by glass panels, for three of four days until a clear medical history had been obtained. A block for private patients was made possible by the Canadian-born Lord Woolavington, who donated a large sum of money for this purpose in memory of his wife who had died in 1918. At this time patients could only be admitted if their income was below certain strict levels. Middle-class patients therefore could only be treated in nursing homes, which were expensive and not very well equipped. The hospital board decided to convert the residents’ block in Cleveland Street, built in 1887, and the Sisters’ Home, built a few years later, into a private wing and to build new premises for the resident house staff. The Woolavington Private Wing opened in 1934. The Crosspiece and the East Wing were completed in 1935 and the new building was officially opened in June by the Duke of York. The hospital had 712 beds and had cost £1,125,000 to rebuild, entirely paid for by donations — some large and some small (one milliner in Oxford Street had collected 5,000 farthings — about £5.21). It had seven storeys and was built to the same style, with projecting wings and a crosspiece. Even the clock was replaced in the pediment, now with a gold face instead of a plain one. The entrance hall was panelled with Robinson’s paintings representing Acts of Mercy. Beyond the hall was a terrace which led to an open courtyard, surrounded on its four sides by the hospital. The main x-ray department, gifted by Mr W.H. Collins, a London businessman, began working on the day the hospital opened. A radiotherapy department, the gift of Mr E.W. Meyerstein, a retired stockbroker, was almost complete. Both benefactors gave a further £50,000 each to endow these departments. Mr Stafford Bourne, one of the founders of the department store Bourne and Hollingsworth, donated the funds for an operating theatre, which subsequently bore his name. A new fracture unit was planned. During World War II, the top three floors of the hospital were emptied of patients for safety reasons, and were damaged by bombs. As a teaching hospital, the hospital was in charge of one of the sectors of the Emergency Medical Service, with its advanced base hospital at Mount Vernon Hospital. In 1948 the Middlesex Hospital joined the NHS and became the lead hospital in a teaching hospital group which included its convalescent home at Clacton-on Sea, the Hospital for Women in Soho, St. Luke’s-Woodside (a psychiatric hospital in Muswell Hill) and the Arthur Stanley Institute for Rheumatic Diseases (previously the British Red Cross Clinic for Rheumatism). In 1958, the hospital acquired Caen Wood Towers in Highgate for use as a post-operative recovery and geriatric unit (its name was changed to Athlone House, after the Earl of Athlone, a former Chairman of the Board of Governors). The hospital was entirely funded by voluntary subscription until the founding of the NHS in 1948. In 1980, following a reorganisation of the NHS, the hospital together with University College Hospital and several smaller specialist hospitals in the area came under the control of the Bloomsbury Health District. In 1984 the in-patients’ building of the Royal National Orthopaedic Hospital in Great Portland Street closed and services moved to an upgraded ward on the fifth floor of the Middlesex Hospital. Princess Diana opened the Broderip and Charles Bell Wards in 1987. They were the first in the United Kingdom dedicated to the treatment and care of patients with AIDS and HIV-related illnesses. In 1992, St Paul’s, St Peter’s and St Philip’s urology hospitals closed and moved their services into newly refurbished ward accommodation at the Middlesex Hospital. The hospital closed in 2005 and all services moved to the new £422m PFI-built University College Hospital in Euston Road. The 16-storey tower there has been named the Middlesex Tower in honour of the hospital. The Middlesex Hospital closed its doors in December 2005 and sold the site to a developer. The final redevelopment scheme preserved the chapel and the façade of the historic radiation wing on Nassau Street. Due to the international financial crash in the mid-2000s, the site lay dormant for some years. The chapel remained visible as a little island in the middle of the vast, empty site, with just the adjacent Nassau Street façade keeping it company. In 2011, the redevelopment was finally begun by new owners Exemplar and Aviva. The chapel was carefully underpinned, as all around it excavations began to build a four-storey-deep underground car park. 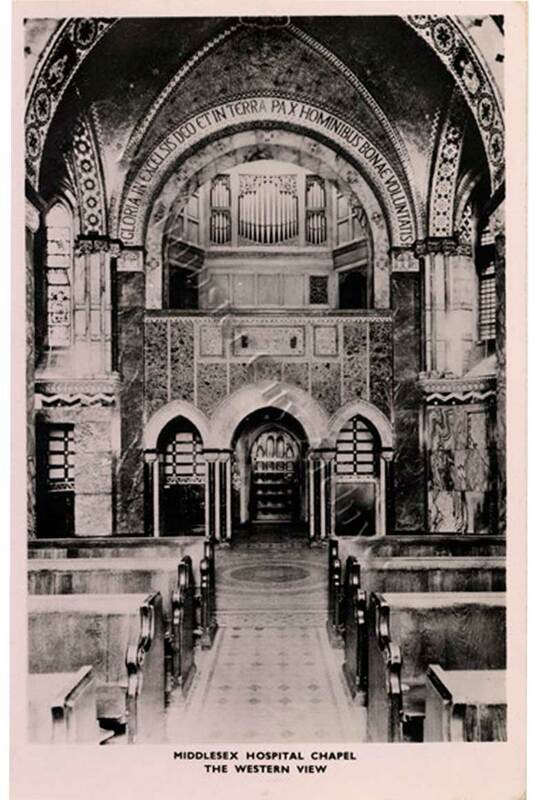 As part of the planning agreement with Westminster City Council, it was agreed that the developers would fund the restoration of the chapel, and that it would have a community and cultural focus, and be overseen by an independent charitable foundation. 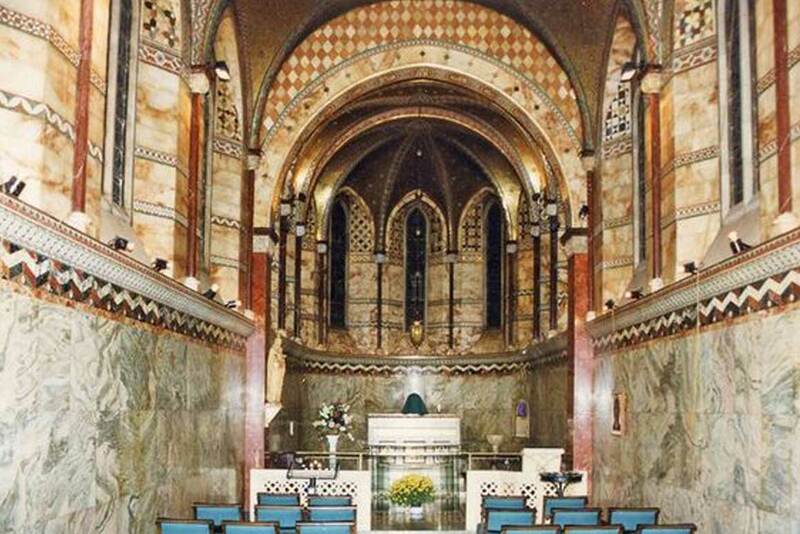 The Fitzrovia Chapel Foundation was created to provide a sustainable future for the building. A plaque marking the former Middlesex Hospital’s role in the history of the site has been added to the chapel. 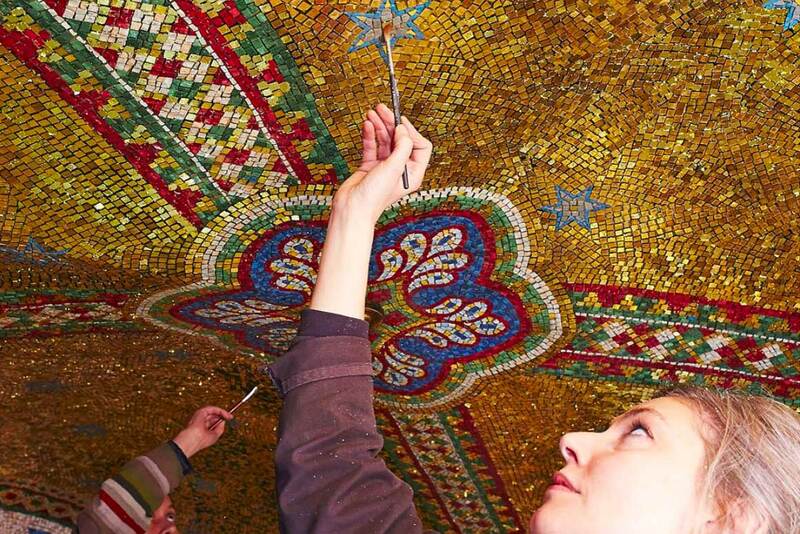 The restoration of the chapel was carried out by conservation architects Caroe & Partners, with the biggest task facing them being the repair of the incredible mosaic and marble interior. Over the years, rain water had seeped inside the old roof, damaging and detaching many of the mosaic tiles and marble panels. 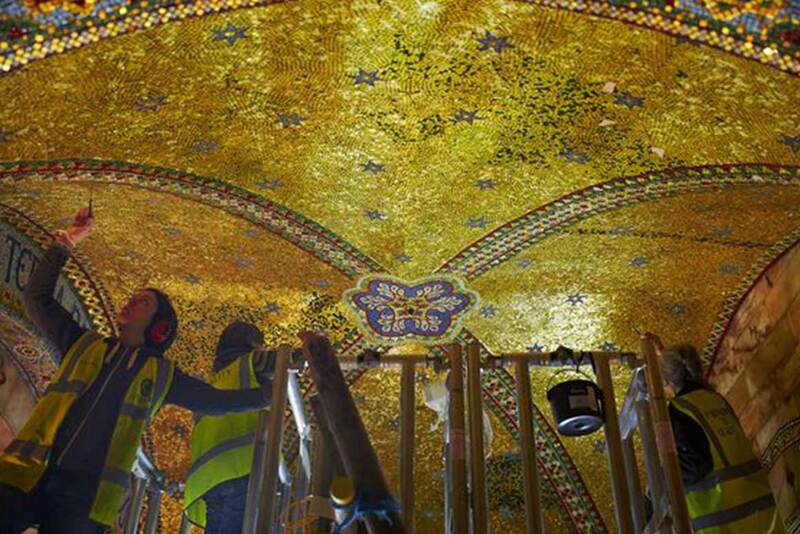 Once the roof had been replaced, the interior could be restored, which involved replacing up to 70 per cent of the gold leaf on the ceiling, re-gilding most of the tiles, as well as re-attaching or replacing the marble panels. The exterior brickwork was also repaired and repointed, obliterating some of the damage that had been caused by temporary buildings and huts that had clustered around the chapel through the year. This had made it almost invisible as a stand-alone building.